Join me on a journey towards a life lived wide awake to the miraculous and the mundane all around you! She walks in with a limp. Her left hip exaggerated, her right leg dragging behind. It’s noticeable and I find myself staring. I want to look away, but there is something in me that keeps at it. It’s not how different it looks than those of us who walk ‘normally’. It’s not the speed at which she moves. It’s this tugging, this longing, the way she stirs my soul. It’s the same tugging I feel when I hear of brokenness half a world away and half a block away, and half a heart away in my own life. It’s the same longing that aches when the cancer comes back in our friends and acquaintances. It’s the same stirring when I hear of marriages on the rocks and shame ripping lives apart. Relationships don’t work as they should. We create things, but for wrong reasons. We find our creations lacking, even as strive for their perfection. Our work doesn’t come together as we’d like and our ruling and subduing stands to fail, each day. Our bodies fail us, our bosses assail us, our lives stand to do everything put prevail… Or so it seems. Things Are Not As They Should Be… BUT they will be! We have this deep sense within us that things, yes, all of life is not as it should be. And so this longing, this ache, which comes as I see her limping reminds me that while things are not as they should be, they will be as they should be. While she limps in and shiftiness takes over, she steps to the seat and finds rest. As I watch her sit, I find this longing as a type of prayer. This prayer is from a deep place. It comes from a deep heart memory of the garden of Eden. Eden, this place where things are just as they should be. Eden where all wholeness and harmony found its place among relationships and work and creation and humanity. Eden where God walked among his people freely and humanity knew experientially, in a fitting and deep way, their Creator. Eden, this symbol of how things are meant to be. We long and ache because we remember our origin. We ache and long because we know that all we see, all we experience, all we have here, isn’t all there is. For there is beauty beyond the ugliness. There is peace beyond the chaos. There is hope beyond the despair. There is grace beyond the condemnation of life. And so when we long for things to be made right, what we long for is for God to remake us, for God to create again a new heavens and a new earth, with all the goodness and generosity of Eden. This longing resides in the promise that yes, these longings will be fulfilled. Everything will be made right. Not all is lost, friends because while things are not as they should be, they will be. Hold on, dear ones, because it will all be restored. Hold on because a new heavens and a new earth IS COMING. These limps- physical and emotional, spiritual and intellectual- yes, YOUR limps, they will be restored, healed, made whole again. We, who walk with limps and live with aches, will run and leap with abandon when it’s all restored. We who find ourselves broken in so may ways, will be put back together, and not just that, but given newness and lightness, as if we never were broken in the first place. 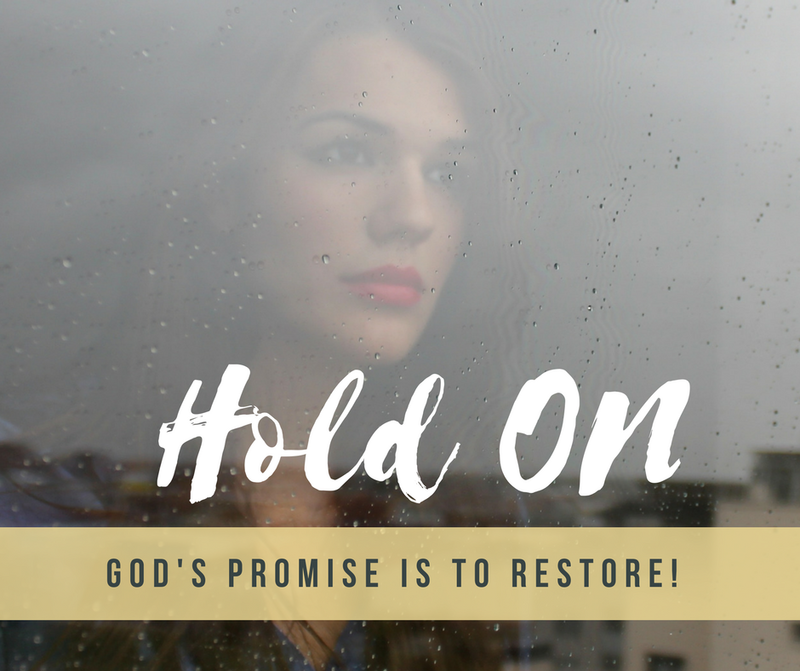 Hold ON… Your Restoration Is Coming! When the pain seems unbearable. Hold on, for it will all be restored. Christ our Savior is making everything whole again. When the disease eats away, and deteriorates quality of body and quality of life. Hold on, for it will all be restored. Christ our Healer is making everything new again. When the heartbreak of loss comes knocking on the door. Hold on, for it will all be restored. Christ our Lover is making everything fulfilling again. When the confusion of relational conflict finds its way into your life. Hold on, for it will all be restored. Christ our Friend is making everything fit again. When your work just isn’t working and you hit roadblock after roadblock to move forward. Hold on, for it will all be restored. Christ our Creator is making everything move again. When you’re shut down or put down or kicked down. Hold on, for it will all be restored. Christ our Way is making a way for everything, including you. Hold on, my friends, hold on. Eden has been placed deeply in our hearts. So deep that the Enemy can’t take it all out of us. This is why we long, this is why we ache. As you hold on, help those in your life who are limping to walk a little lighter. Remind them, all things are will be restored. Eden will come again, with Christ’s redemption painted all over the atmosphere. We will breathe wholeness, live wholeness, be whole again. Hold on, hold on, hold on… Christ is coming and with his coming, it will ALL be made new again! If you're longing to find meaning in the midst of the mundane in your own life, I have a gift written just for you. 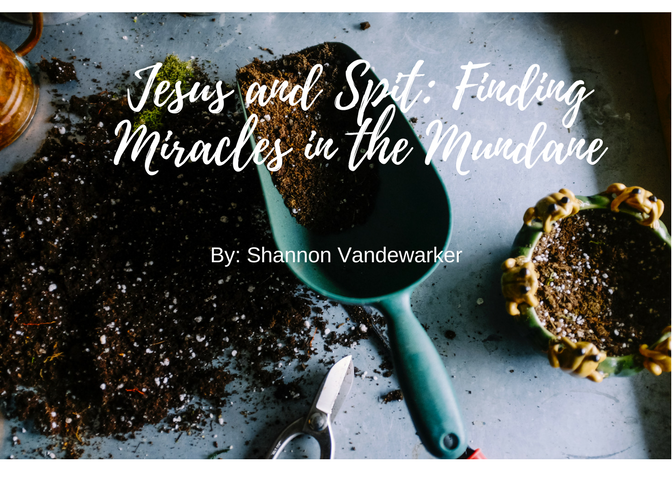 My e- book called Jesus and Spit: Seeing the Miracle in the Mundane is yours FREE when you sign up here. Join me on this journey to discover the miracles God has in your ordinary life! Is There Truly Never Enough?